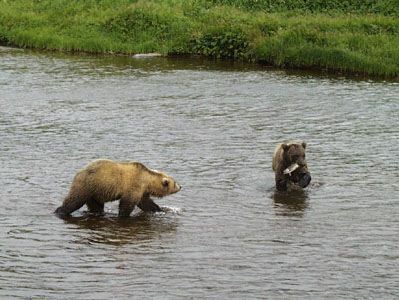 One thing that is quite obvious, watching bears with cubs, is that the cubs rely on their mothers to catch fish for them for several years. They sit on the river bank, waiting for her success and then try to take it away from her which she usually allows but of course, she too has to eat. 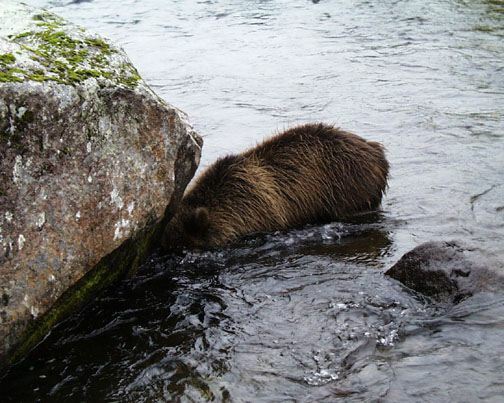 Even large two year olds are often dependent in this way, preferring to let mother do the difficult and often hard work of chasing and grabbing salmon as there are many variables that require persistence and good judgment. Adults have varying degrees of fishing skills. Some never seem to get the hang of it while others make the difficult task look easy, just like fishermen everywhere. Our cubs have always seemed to understand that they had to be independent when it came to fishing, so they seemed to pay attention for a change when we made an attempt to give them fishing lessons. Looking back on it, this was one of the few instances that we might have taught them anything. That and their good manners of course. When they were very young, we put some dead fish in a small rocky steam that we had blocked off and then led the cubs to that place. They were delighted at the find and even though they had to put their heads under water, they quickly learned to do this to find the dead fish. We knew that they would look there again, so the next time we took them on a walk to that area, we had planted some live fish in the same place. They spent hours trying to get the char and were eventually successful because the size of the stream gave them the advantage. We were amazed at how they never forgot this lesson or the place. A year latter, they would run to the spot to see if there just might be fish to be caught again. That first summer their interest was kept up by finding dead and dying salmon along the lakeshore. Because fish are such a wonderful shortcut to getting fat for hibernation and important also for our cubs independence to survive without a mother, we have watched with delight this year as Chico, Biscuit and Rosie become very adept as fisherbears. There was luck involved in two ways. Only in years with exceptional pink salmon runs do they come all the way up the river, through the lake, and then up the creek that runs by our cabin, to spawn along it for about a mile. This year, the water level was also low, so these things, and the fact that they had that creek to themselves (because there were so many salmon every where), provided a wonderful fishing opportunity for them. It was amazing how quickly their skills at catching them grew and also how much they could eat! When we were with them and they made a particularly good catch, we would make a big fuss about it and they obviously enjoyed the praise. At the time the fish came in to the creek, the cubs were a bit skinny and were shedding their winter hair, (not a pretty sight!) but within a week, with all this protein available, they filled out, shed off and looked like different bears. Their confidence quickly grew, and fortified with their independence, which they have been developing from a very young age, nothing is now too difficult to try. I was amazed to see them wade into a school of char and two of the three cubs managed to each catch one. 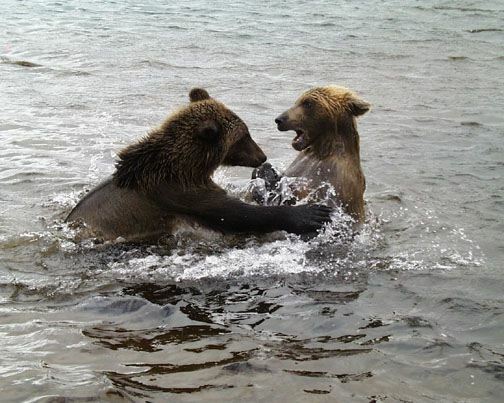 Only a few adult bears will even attempt to catch these trout like fish in this particular pool and often they are unsuccessful. Yesterday, we watched them catch fresh run sockeye salmon in the Kambalnoe river, again a difficult task. Given that a year ago, when they were less than a year old, they demonstrated that they had the resourcefulness to dig a den on their own and hibernate successfully for six months, we are feeling very relaxed about them and their ability to eventually, all three, becoming grandmothers. This is our benchmark of success for this project. We have some good weather and are having lots of fun now. After the fog and bureaucracy we have just decided to enjoy the remaining time that we have here. Other years, September has been a beautiful month.